College running quarterbacks such as Tim Tebow and Johnny Manziel have struggled in their translation to the NFL. In the college game, running quarterbacks often looked for a hole to run through if they could not find their first or second reads, and tend to have a lack of patience in the pocket. In the NFL, this simply does not cut it; the pocket is tighter, there are more bodies around you, and pass rushers are bigger and faster than you have ever seen before. However, unlike Tebow or Manziel, Newton had no trouble playing from the pocket, putting up 422 passing yards in his first NFL game. You will never see Cam Newton take off on a pass play unnecessarily, he literally has to be FORCED out of the pocket, and when he is loose, he makes good use of his freakish athletic ability and makes defenders pay. His combine numbers show you this rare physicality, running a 4.58 40-yard dash at 6’5” and 245 pounds. But despite his physical gifts, he understands the importance of putting time in the film room, and his knowledge of the game is one of his most overlooked strengths. We often look at Cam Newton’s physicality and overlook the things that show his potential to become a great quarterback, such as his mental approach and passion for the game of football. His preparation and love of the game draw comparisons to Peyton Manning and Tom Brady. But with all this upside, both physically and mentally, what was it that hindered Newton this season? Not to make excuses for his lack of production, but the major causes for decline this year may not be self-inflicted. Coming back from ankle surgery and a back injury caused by a car accident definitely affected his health, but Newton was probably stinted the most by his own offensive coordinator Mike Shula. We thought that the last time we would see Cam Newton in formations like this was in college but Mike Shula decided he was going to bring them back. However, wishbone and veer option offenses simply do not work in the NFL. The Panthers often try to force multiple option plays and designed quarterback runs into their playbook to take advantage of Newton’s running ability. While they can blow up for large pickups, these plays are stopped relatively easily and put the quarterback in too compromised a position. This is not to say the read option has no place in an NFL offense. The read option is a great play to prevent negative yardage in certain situations, and almost any quarterback can pull the ball and turn a potential 2nd and 12 to a 2nd and 8; and with Cam Newton at quarterback, 20 yards off the option is more likely than 2 yards. But no NFL offense should revolve around the option. While it is nice to have in your back pocket, and your quarterback’s athletic ability IS an asset, neither should be relied on and should especially never be abused. 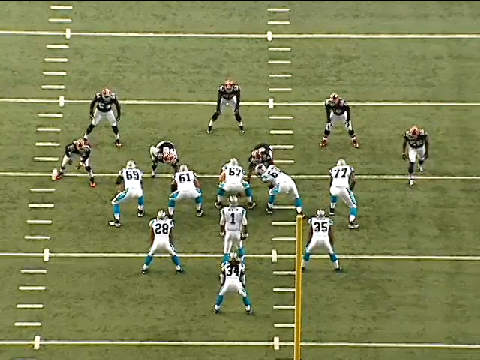 In the playoff game against Seattle, the Panthers came out running option after option out of weird formations like this one, getting little out of it besides beating up their quarterback. But when Newton was given the opportunity to make the proper audibles and checks, and make his reads from the pocket, he exceled. Although he made his share of mistakes against Seattle, such as targeting Richard Sherman in a one-on-one situation, if he was given the opportunity to take control of the offense on his own on more drives, we may have seen a better outcome. It seems however, that the Panthers simply do not have that trust in Newton as a quarterback and as a passer. It is incomprehensible why this trust does not exist, because purely from a quarterbacking aspect, Cam Newton shows the physical skills as well as the intangibles and mental presence to be a great quarterback. It may be seen as an unequitable comparison, but his mental presence in the film room and on the football field draws an evocation of a young Peyton Manning. It is easy to see the work ethic and attention to detail Newton has, and his passion for the game is irrefutable. Even if there are questions about his accuracy, footwork and mechanics, it needs to be reinstated that these are all things that can be improved upon, but the more subjective qualities that he possesses cannot be taught. Despite the sloppy outcome of this season, there still should not be any doubt in Cam Newton as a quarterback, but rather in whether or not the Carolina Panthers will let him be that quarterback.